It’s time for another movie review presented by our good friends over at FatCats Gilbert on the southwest corner of Greenfield and Baseline. FatCats Gilbert is the best place to see all of the latest box office hits like the brand new Marvel film, Black Panther! To see all showtimes and to purchase tickets, you can click right HERE! It’s only February, but I already get to talk about some of my most anticipated movies of the year! Annihilation is the new movie from Alex Garland, writer-director of 2015’s Ex Machina. I thought that Ex Machine was one of the best sci-fi movies of this decade, and though it’s an unfair standard to hold any movie to, I was hoping for more of the same from Annihilation. I did pick up Jeff VanderMeer’s book, but I’m actually going backwards with this one. I wanted to see this film before reading the book because of how surprising the trailers looked. Garland was also teaming up with some of Hollywood’s best actresses as well as one of the stars of Ex Machina, Oscar Isaac. Let’s see if he could capture that sci-fi magic once again! Annihilation is directed by Alex Garland and stars Natalie Portman, Jennifer Jason Leigh, Gina Rodriguez, Tessa Thompson, Tuva Novotny, and Oscar Isaac. After attempts with military units have gone awry, a group of five scientists enter a place called The Shimmer. The teams that have entered The Shimmer have either been killed or gone crazy and killed each other. Can the scientists make it to the source of The Shimmer and report their findings back to the government agency overlooking this horrifyingly beautiful area? I’m not going to beat around the bush here. I think that Alex Garland knocked it out of the park again with Annihilation. He’s one of the few storytellers who has the ability to leave me feeling empty inside, but curious and full of thoughts. This is the kind of movie that I see one day, then I continue to think about it and think about it before actually sitting down to organize my thoughts. I wanted to mull over my theory and make sure that I truly believed in it. After over a day of being unable to get this movie out of my head, I completely stand by the way I was feeling coming out of the theater. I think that Annihilation is one of the best sci-fi movies of the decade. First of all, Alex Garland’s storytelling is brilliant. It’s psychologically haunting, but it also stirs my brain and makes me contemplate my own philosophy. It forces me to analyze the way my thoughts align with the film’s ideas, and comparing and contrasting my views with the views of this movie is the exact reason that I love thought-provoking science fiction. Garland is able to blend the science fiction tones with horror and drama so well, and he masters the character dynamics through exploring those genres. 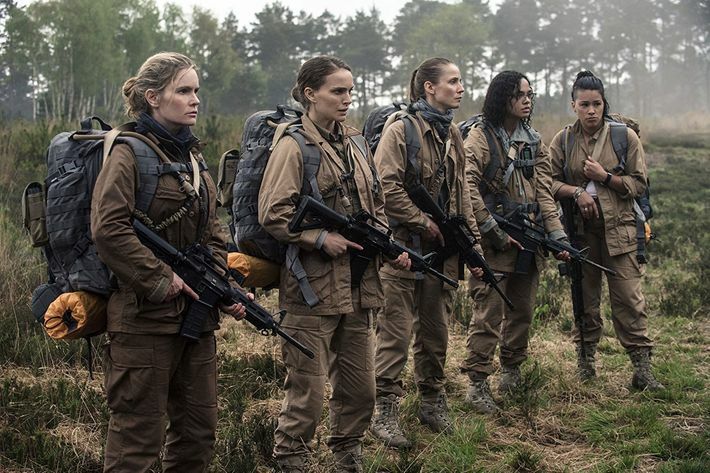 I wouldn’t say that Annihilation is the type of movie to keep me on the edge of my seat with action-packed thrills and excitement. It’s more along the lines of chicken pox. I can’t move my attention away from them, and no matter how terrified I may be to scratch the itch, I can’t help but do it. I also loved the visuals in the film. The Shimmer is such an interesting setting for this premise, and it’s incredibly stimulating both as a place and as an entity. It feels like a live character in this film, and the effects that bring it to life create an artistic nightmare. Being an audience member observing The Shimmer, you’re forced to take the ugliness of its creations with its beauty, and I don’t think that the film ever even scratched the surface of predictability. If you’re looking for original movies that make you think, refuse to give you what you want, and allow you to create ideas inside a story-world, do yourself a favor and go see Annihilation. I don’t believe that I’ve ever seen a movie like it, and being able to experience those twists and turns through The Shimmer is more than entertainment. This is a visual and psychological marvel. The characters are also brilliantly realized. Once you have been fully invested into this story-world, you begin to realize that the characters are all broken on the inside, and I loved peeling back the layers and understanding their imperfections. I couldn’t write this review without mentioning that Natalie Portman gives an excellent performance. Surprising, right? I experienced this world through her, and her emotional dread and emptiness propelled the story forward. I also thought that the rest of the cast including Gina Rodriguez, Tessa Thompson, and Jennifer Jason Leigh gave spectacular performances as well. Each character goes through a complete progression and showcases different viewpoints in approaching their situations. They’re nuanced and multi-dimensional, and the changes they make throughout the film are justified by their experiences, their backgrounds, their areas of expertise, their levels of curiosity, and so much more. I wouldn’t be shocked to see this movie analyzed in the future simply with the intentions of picking each character apart because it could be an extensive study. One thing that I do feel I must mention about Annihilation is that I believe that it helps to have a theory. If you aren’t interested in forming a theory about this story and the finale in particular, this may not be for you. If you go to the movie theater simply to be entertained, I probably wouldn’t send you out to the theater for Annihilation. If the reason you go out to see movies on the weekends is purely for escapism from the real world and to take a little bit of a break from the week-long grind, more power to you, but if you go out and purchase a ticket to Annihilation, prepare to be tested, and know that you won’t get all of the answers. I have my own theory which I won’t discuss as to avoid spoilers, but simply having some way to justify what I witnessed that I truly, and, of course, subjectively, believe is the correct interpretation helped me process the film. I wouldn’t be able to walk out of this movie and refrain from theorizing, and I think that Annihilation is better for that reason. If I had to pick one gripe that I had with the movie, there is a certain aspect of character motivation and drive that feels tacked on. It’s not so much an interpretational aspect as much as it is an objective driving force in the plot that feels very weak between Natalie Portman’s Lena, Oscar Isaac’s Kane, and one more character. There are pieces of it that feel left out, and I missed a good chunk of why it was able to put our characters in the position and state of mind to enter The Shimmer. I actually thought that the supporting characters were much simpler in their motivations, yet they were more effective. Again, I found everything about Natalie Portman’s character fascinating, but one aspect of her motivation, as well as Oscar Isaac’s, felt weak. Overall, Annihilation is a brilliant sci-fi thinking piece that I honestly believe is destined to become one of the quintessential pieces of this decade’s science fiction art and storytelling. It is a movie that digs at you and digs at you until it finds your roots, then it investigates those roots. It forces you to think outside your own box, and it makes you contemplate the philosophical ideas that it offers. Alex Garland does an incredible job exploring those ideas while also using brilliant sci-fi, horror, and dramatic elements to connect us through emotions. The visuals are spectacular, and Garland has proved to be an aesthetic genius. He obviously has a clear vision for both his visual composition and his messages, and he has become one of my favorite directors. If you want to see Annihilation, expect to be challenged. Expect to walk out formulating opinions and theories that allow you to justify the experience. I think it would be nearly impossible to walk out and think of Annihilation as just a piece of entertainment. Annihilation is a rare flawed masterpiece. I can recognize that it may have a weakness, but it’s going to refuse to allow me to forget it. It’s so strong in its mental and psychological storytelling that it overcomes those issues to become a movie that may stick with me for decades. Also, if you’re going out to see it this weekend, bring someone with you. This is one of the biggest conversation sparkers I’ve seen in years. I’m going to give Annihilation a 9.5/10. Will you be seeing Annihilation? Comment down in the comment section and let me know! As always, thank you, and keep listening to 88.7 The Pulse.